In the last publication we talked about gold and silver hallmarks. The holidays are coming, and many of us need extra money. What other items may be of value in this economy besides gold, silver and diamonds? One thing we tend to see a lot of is timepieces. Better watches such as Rolex or Patek Philippe are holding strong and we have actually seen prices go up in recent months, even on stainless steel models. 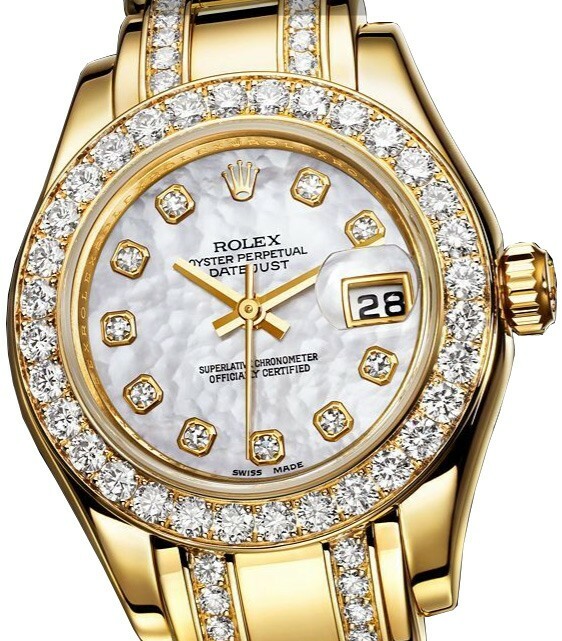 Rolex watches are not bought for gold content; they have value in the name. This is fairly rare for most other watches. A stainless steel Rolex could be worth more, than a different model with a gold case and band. The value is independent of gold content in many cases. This is especially true for watches purchased in the last 20 years. How do you determine the value of a Rolex? The model number is the biggest factor for the base value, then condition and working order. Men’s full size watches tend to move for stronger prices than the 3/4 size models and ladies’ watches. The band is another factor; a watch with the original stainless band in pristine condition can be worth a thousand dollars more, than a watch without a band. If the band is worn, the value is depreciated according to the wear. Do you have any events planned for Christmas? We have a neat little promotion that Ray and I started recently. We were toying around with the idea of letting customers pick a diamond out of a bowl of CZs. If the customer finds the right stone, they get to keep it. While thinking about the concept we were looking at half carat size CZs and dropped a diamond in the bowl and lo’ and behold, it literally vanished, we could not tell the difference. If a lucky customer can, they get the diamond. What is the giveaway diamond worth? The one we dropped in has a retail value of around $1,000 to $1,500 if you were to buy it in a retail store. Can the customer sell the stone back to you? Yes, we will buy it back at the going wholesale rate. Do they have to buy or sell anything to participate? There is no need to buy or sell anything, just come in and say hi and ask about the event. Limit one try per customer per month until someone finds the diamond. We plan on running the event until someone finds the stone. Do you have any great Christmas gift ideas for Ashlanders this year? We have some new jewelry that I designed while traveling in Bali, very neat pieces that include our top selling Paua shell & sterling silver turtle pendant. Turtles are very popular from Hawaii to Indonesia, but most of them we see as pendants lack dimension and are mass produced. We made a fully dimensional piece that has lots of eye appeal. Other pieces that work well as gifts include our 4.5 carat Amethyst sterling silver butterfly ring and our Bali-style pendants. The shop is fun to browse and most pieces there have a story behind them. You are giving away a diamond – do you sell your diamonds to the public? Most of the diamonds we buy over the counter are recut & polished, then sold in Israel or Hong Kong, however from November to February we stock inventory for local sales. The prices are very comparable to what dealers would pay when we wholesale them. What else do you offer for sale to local customers? We are always buying and selling investment coins, both silver and gold, and we also offer some of the more unique estate items that come in over the counter. If you have a man on your list that is hard to buy for, consider gifting them a coin. If you have a lady on your list that is hard to buy for, consider gifting them a diamond or a locally designed piece of jewelry.